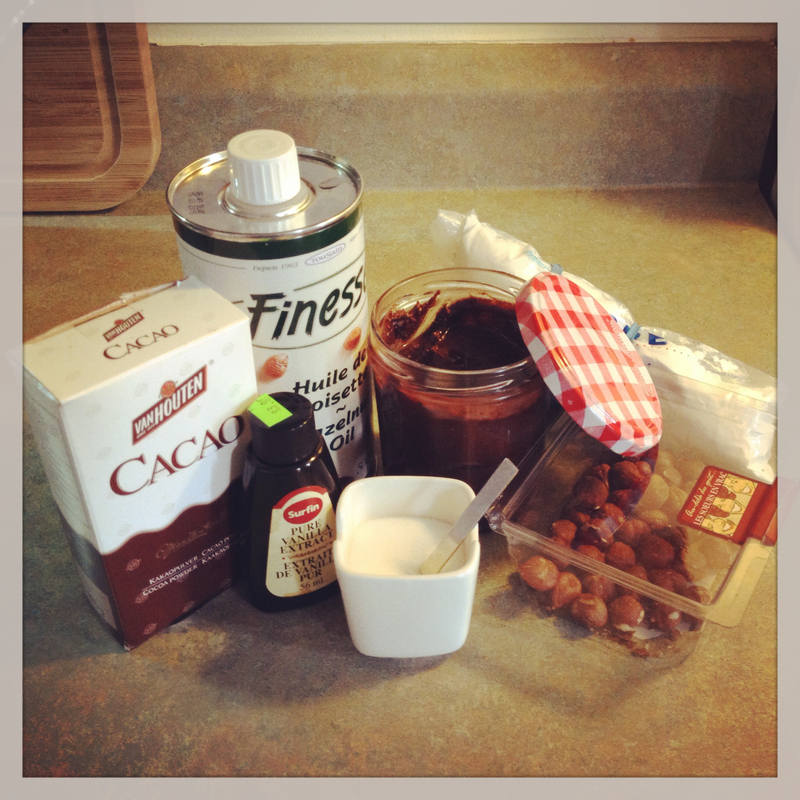 Homemade Nutella Recipe: Forget Palm Oil! Do you love Nutella but feel guilty about consuming such obscene amounts of palm oil? OF COURSE YOU DO. Everyone does. How can you not love Nutella? This week I discovered this homemade Nutella recipe by Lollie Rock posted on mamansquidechirent.com (loose translation: momswhorock.com). Since it is in French, and since I discovered a helpful trick to make this recipe easier, I thought I’d share with you guys. After skinning and toasting your hazelnuts, toss them in your mixer. You’ll want a good mixer to be sure that you get a nice, smooth consistency (unlike mine which resulted in a somewhat granular–but not unpleasant!–Nutella). Blend them until they have a smooth, buttery consistency. (Alternatively, save yourself some time and find hazelnut butter at the store). Next, add the rest of your ingredients one by one, mixing each in thoroughly before adding the next. Starting with the hazelnut oil will help keep things nice and moist. Mix thoroughly. If you find your Nutella is too dry or grainy, add a touch more hazelnut oil until it gets the consistency you want. Don’t worry about the amount of oil: you’ll never get as much in there as in the real thing. I read somewhere that the best way to skin and roast hazelnuts is to put them in the oven at 175°C (350°F) for 15 minutes, then rub them in a tea towel to get the skins off. I also read that this technique is only partially effective. So I did some googling and found this article from mybakingaddiction.com that revealed a secret shown to Julia Child: boil the hazelnuts in 2 cups of water and 3 tablespoons (you read that right!) of baking soda. Boil: 2 cups of water. Add: 3 tbsp of baking soda. Pour in your hazelnuts. The water will turn black and will foam up. Boil for 3 minutes (or thereabouts). In the meantime, prepare a bowl of ice water. Pick out one hazelnut to test. Drop it in ice water and if the skin slips off easily, drop the rest in. Then simply slip the skins off the rest of the hazelnuts one by one, and place them on a tea towel to pat dry. Toast in the oven at 175°C (or 350°F) for 15 minutes. Your kitchen will smell lovely. The production of palm oil is linked to the destruction of rainforest in Indonesia, further endangering species like the orangutan. Visit the World Wildlife Fund’s website for more information about palm oil and why you should avoid it. The best receipe so far. I Will do it again this week for my lover and I.